Fred ‘wakes up’ and discovers he’s a puppet. He is just coming to terms with this terrifying revelation when he meets The Director who tells him that, not only is he a puppet but that he is starring in a show about his life. So begins the swift decline of Fred. Threatened with having his Puppet Living Allowance (PLA) taken away he has to take a job as a childrens party entertainer. It doesn’t go well, nor does his date. After a hilarious scene of him battling through rain and wind and snow he ends up in a bar and gets drunk. He is then extensively and horribly sick. He decides to end it all by jumping from the top of a ladder (something made more difficult by the fact that one of his puppeteers ‘the leg man’ has been taken away as part of the PLA cuts. 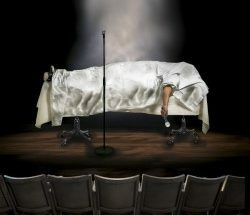 Saved by his maker he decides to leave this artificial world of the stage and try the real world outside. Fred has been at the festival before – in Blind Summit’s excellent ‘The Table’ but this time they are working in partnership with Hijinx theatre, a Cardiff based company for learning disabled actors. It is testament to the incredible skill of the three puppeteers that Fred, a blank calico doll is brought to life so completely that the audience is completely engaged in his world and empathises with his problems and difficulties that often don’t seem that different from our own. Fred wants to be like everyone else, but being a puppet stands in his way, he is completely dependent on his puppeteers and as a result he feels marginalised and under- valued. The parallels that are being drawn between Fred and the actors around him are obvious. The energy dips towards the end of the hour and the story doesn’t wrap up particularly neatly but these are minor niggles. 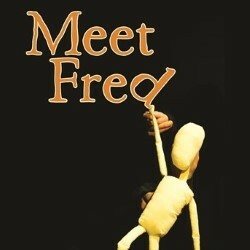 Meet Fred is clever, innovative and hilarious.